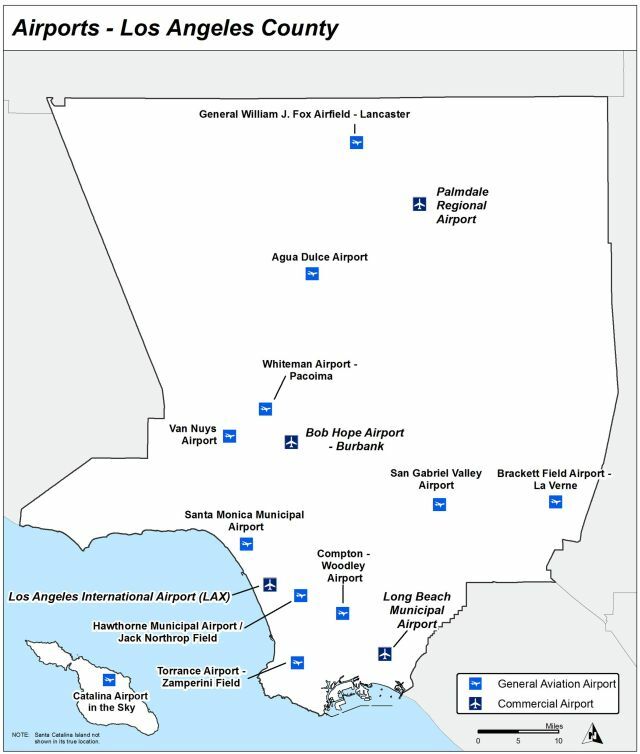 There are 15 airports within LA County ALUC’s jurisdiction. Five are County owned, nine are owned by other public entities and one is privately owned. The airports, related plans, maps and recent projects are listed in the table at the end of this page. GIS Interactive Map (A-NET) Use this tool to find out information about the various airports in Los Angeles County. Start by selecting an airport from the drop down list or use the Search tool and enter an Address, Assessor Parcel Number (APN) or Street Intersection to zoom to a location. The Identify tool is on by default. GIS Layers This is a direct link to the ALUC GIS layers on the LA County GIS Data Portal. It contains four downloadable GIS Shapefiles: Airport Influence Areas, Noise Contours, Runway Protection Zones & Supplemental Areas.